A group of first-graders sporting blue T-shirts gathers in a classroom right after a Tuesday school day concludes at Hemmeter Elementary in Saginaw, Michigan. For any first-grader, another 1:10 at school may be displeasing, but when the additional hour-plus entails putting one foot in front of the other and snacking on apples and string cheese after the exercise, positive energy is difficult to contain. When over 20 kids finally settle in the classroom, another session of Kids Run the Nation is underway. The day before, fourth- and fifth-graders met. The next day would be the kindergartners’ turn. Thursday would make way for the second- and third-graders. KRTN—a national after-school running program teaching children about the sport and encouraging a healthy lifestyle—piloted in Saginaw at Handley Elementary in March 2013. Not even two years old, the Saginaw Community Foundation and the Dow Corning Donor Advised Fund each donated $8,000 to KRTN-Saginaw in August 2014. “The funds are to be utilized for program expansion so interested schools and sites can contact us,” Denise Nightingale, KRTN-Saginaw’s program coordinator, said. The first-grade group at Hemmeter goes through a series of stretches before running. After launching the program at Handley in 2013, KRTN-Saginaw has landed at Hemmeter, Westdale, Loomis Academy, Nouvel, St. Charles and Merrill elementaries. 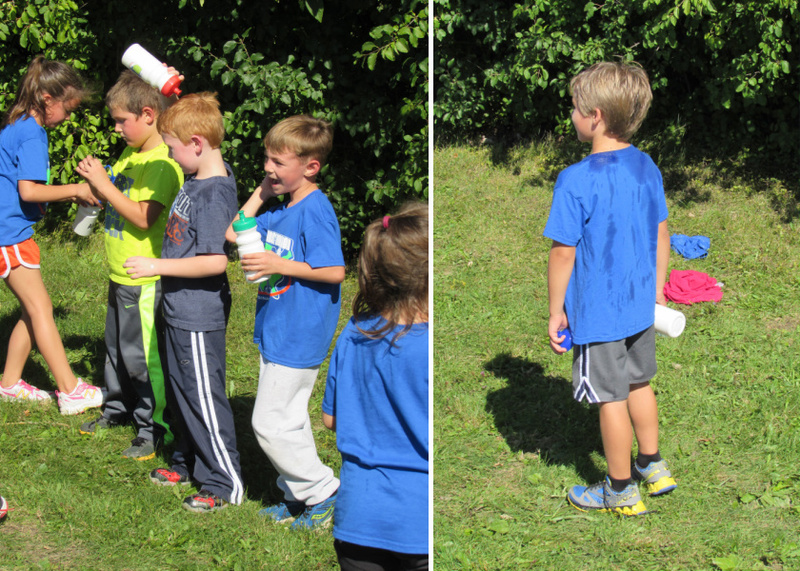 First-grade Hemmeter students stretching post-run and then refueling before departure. The participation numbers will continue to grow as parents and children alike recognize the benefits and joy of running. Plus, thanks to local and national grant support, the 10-week program costs parents just $10—$1/week—for one child. The program began with an initial fee of $30. At Hemmeter, each grade (K-5) meets once a week. 10 weeks, 10 sessions for each child. The program finishes with a one-mile race in November. The first-graders at Hemmeter shuffle out of the classroom and depart for an open field adjacent to the school. As expected, a single-file line is tough to maintain, especially when a few speedsters want to be the first to drop their water bottles and get moving. Water bottles are crucial on this day—nearly 75 degrees with an aggressive sun and not a cloud in sight. A beautiful day, yes, but a bit warm following a week of cooler temperatures more like Michigan fall weather. Week 2 of the 10-week program is about pacing. Many of the kids had probably never heard the word “pace” in relation to running, but that’s one of the beauties of KRTN: children expanding their knowledge of the sport. The group circles up for a stretching session. A few games of Simon Says warm up the muscles even more, especially one led by an energetic youngster eager to get running. 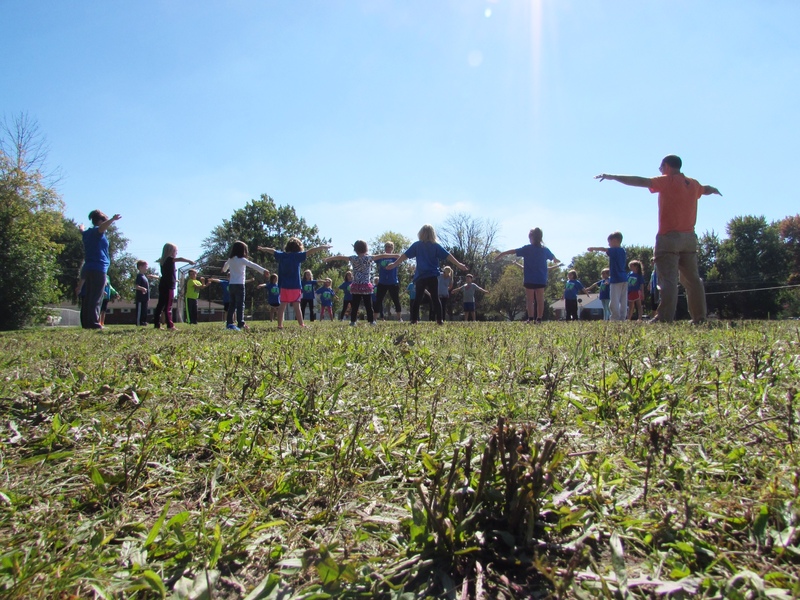 A collective stretch and a student-led game of Simon Says occur before the running. After a few more warm-up drills, the kids are ready to move around the cones set up at four corners of the field. The site coordinator then shows the kids three photos, each one depicting a different animal. One photo is of a snail, another is of a camel and the final photo pictures a cheetah in motion. As expected, the cheetah elicits the most excitement from the kids. Each photo makes its way to its respective cone. The fourth cone has “KRTN” written on it and is closest to the pile of water bottles. The students break off into separate groups, one group to each cone. When you arrive at the snail cone, you walk. At the camel, you jog. When you meet the cheetah, it’s time to let the legs fly. Pacing. Walk, jog, run. 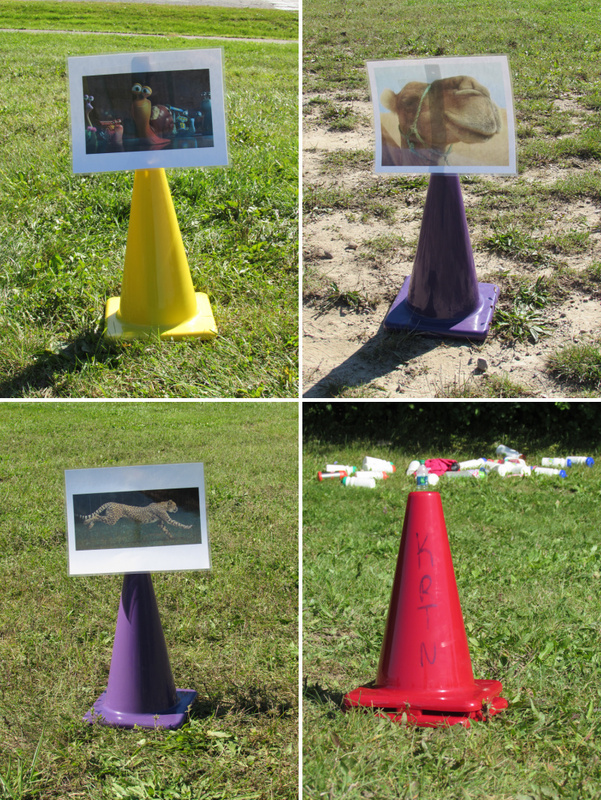 The cones guide the students as they run. Water breaks are encouraged but not mandatory. A few kids keep running with no stops. The sun continues to beat down, and the adult leaders not only provide encouragement, they also run with the kids. Several adult vs. children races take place. Conversely, a few kids can’t wait to get back to the snail. Whatever the approach, the feet keep moving. Sweat continues to hit the grass. Some students count their laps, others challenge each other at the cheetah. Competitive spirits ignite, as do attempts at extended water breaks. Whatever the case, the atmosphere remains conducive to mobile activity, and it remains fun. Races against fellow classmates—and adults—make for friendly competition. It’s evident some kids want to keep running, but cool-down exercises call. It’s almost 3:45 p.m.—the end time for the first-grade session. Rides home are about to arrive. Post-run stretching complete, the students find time to get every last drip out of the water bottles, squeezing the remaining ounces onto their own heads or a friend’s head. A literal cool-down. It’s enjoyable to see how much energy exists after the running. The group joins in on a KRTN cheer that induces the most enthusiastic shouts. Honestly, this chant sounds genuine and passionate. For the next eight weeks, the cheer will only get louder, and the energy will continue to elevate. Water bottles are emptied in a fury of laughter and soaking. Next up: snack time. Today’s energy, however, gradually dwindles as the kids stride back into the classroom for snack time—the final part of the session. It’s part of the learning process: run, refuel, rest. The snacks provided are apples and string cheese. Conversation ensues between classmates who are now further connected because of running. Several take a seat on a classroom rug that provides a map of the world. Kids certainly play a part in running the nation, and the world. 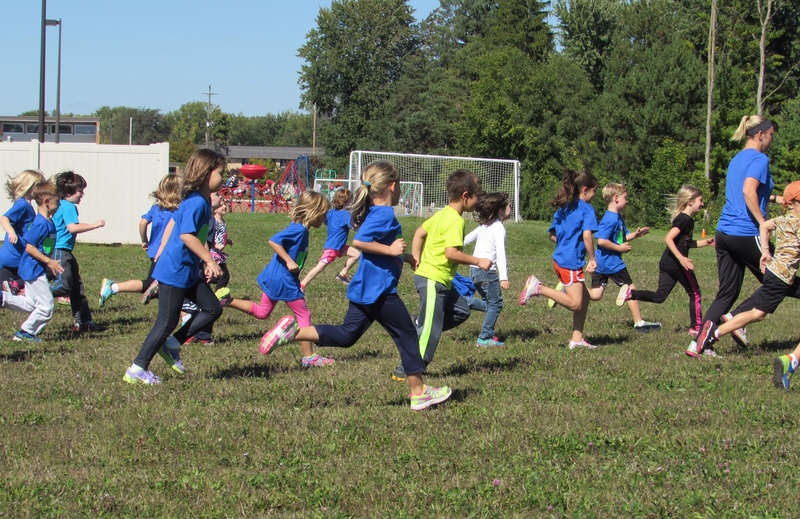 Maybe one first-grader’s attachment to running will someday lead to steps beyond borders. Maybe another’s generosity will someday lead to a more peaceful world. Whether running is a part of their lives down the road or not, KRTN-Saginaw is currently opening young students’ eyes to the jubilation the sport can provide and the lessons it can teach. It’s almost a given these first-graders look forward to each KRTN Tuesday with anticipation. “If each kid has fun while learning about the sport, then I’ve done my job,” Nightingale said. You’ve done your job, and then some. Visit KRTN’s website here, and check out KRTN-Saginaw’s Facebook page.